Meet Gopalattan. He is the head of a traditional blacksmith family. He is 85 years old and still going strong. Even today after a hard days work he needs a bottle of Toddy. Very few among his community still practice it the old way. Many have gone hi-tech. Blacksmith Gopalattan shaping up the edge of Digging Hoe. Once upon a time entire communities – especially farmers – were dependent on blacksmiths and few other craftsmen. Without good tools any work takes longer to finish. He is not just a blacksmith but even a good farmer. He has a plantain plantation under cultivation. He used to harvest a lot of paddy and always had few cows in his shed. He currently owns one cow which his wife takes care of. Both lead a simple life with minimal expenses. Currently no one does this job nor can be bothered to know what it is all about because one can earn 3 to 4 times more than a typical blacksmith; that too with even lesser physical labor. 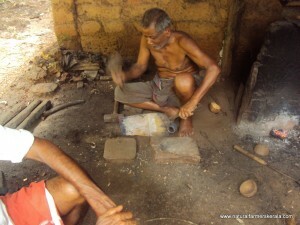 His son works for a laterite stone quarry. 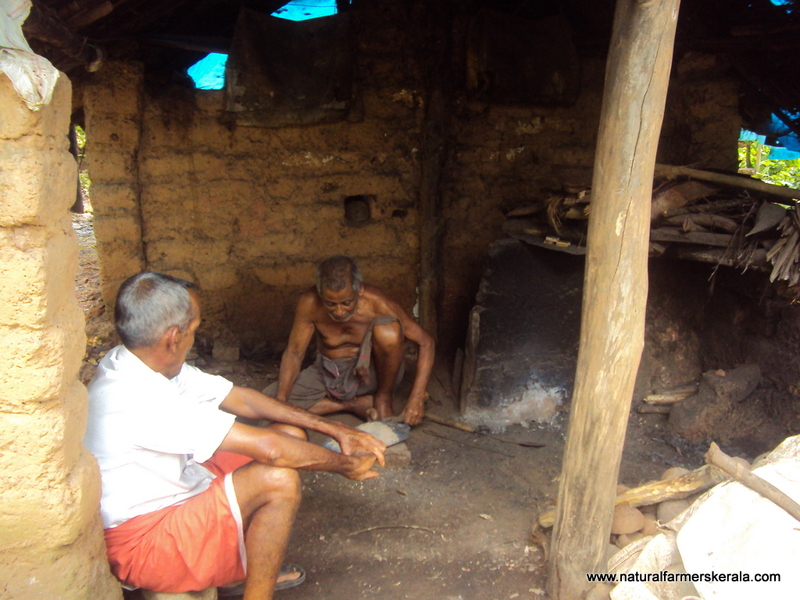 Do not fret for this traditional knowledge will not be lost with Gopalattan. He has taught his sons and a few other family members his craft. So when there is a need they could get dirty. But the generation after this will have lost Gopalattan’s knowledge forever. Gopalattan may not be able to generate hi-tech tools however traditional blacksmiths make robust equipment’s at a relatively cheap price which will last for a few generations. Lifetime warranties on service and repair is implied in such transactions. On the other hand hi-tech equipment’s are not just expensive but also disposable. Still, people want hi-tech equipment’s because of the ease of use. No physical hard work is required with hi-tech tools. We cannot stop time, things keep changing. Gopalattan specializes in making of household knives – other cutting tools, shovel, hoe, traditional door locks, weighing scales and few other traditional equipment’s. 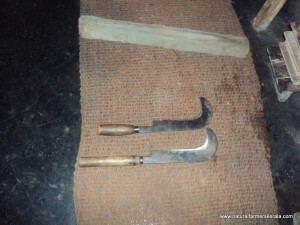 Above knife is knows as katiyal which is made from a iron bar and has a wooden handle, which is know as Billhook globally. Use of katiyal(billhook) is between that of an axe and Knife. I also feel this type of knives are optimized version of machetes. After repeated requests Gopalattan made the above knife for me. He has stopped making new equipment’s only sharpens and shapes existing ones. There are different types of katiyal’s. It is known by different names in other parts of India. Southern Keralites call it va-kathi. 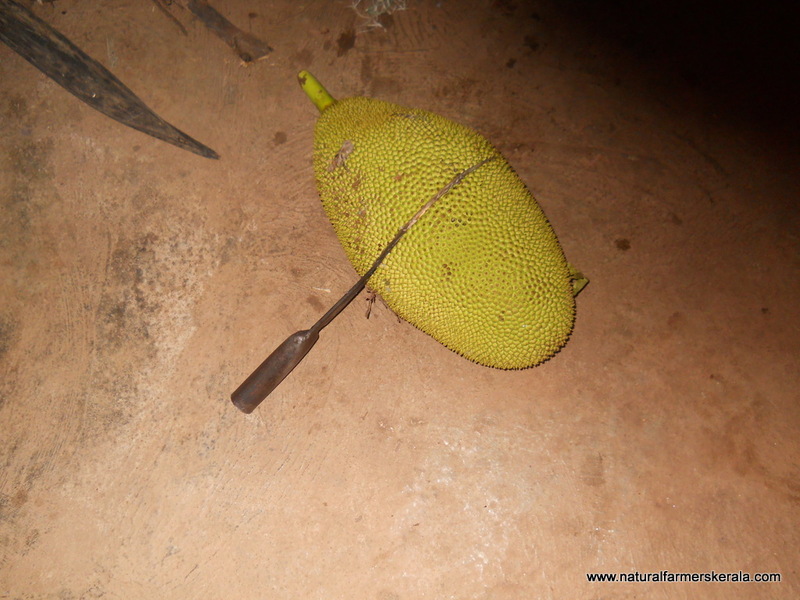 This is how you cut open jackfruit using a heavy knife with force. 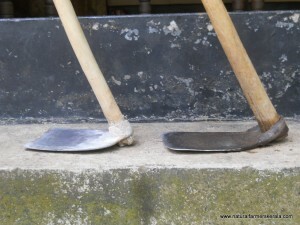 The blade and handle has to be larger than average katiyal. 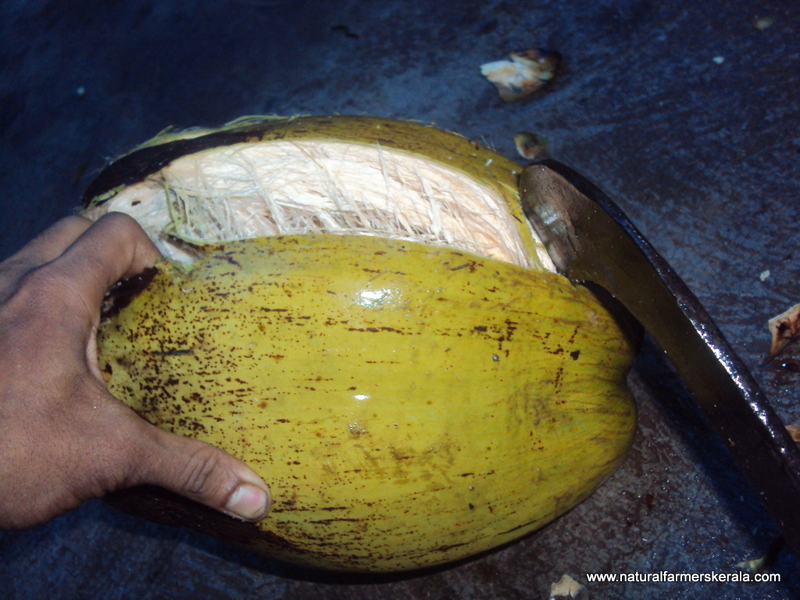 This is because some coconut bunches hang farther away on palms with larger crown. Longer arch on the tip to hook and pull a bunch. The blade must be razor sharp for effortless operation. A traditional katiyal used by coconut harvesters is a total of 24 inch length from tip to handle(standard length) However some prefer smaller or bigger as per individual comfort. The bottom tip of the handle should be ridged so that the knife does not slip off from the hand as easily. Since my knife is short so no ridge can be noticed. Having said so it is not easy to make a good katiyal or any metal equipment’s. It takes years of study by practice to understand the nature of each metal. 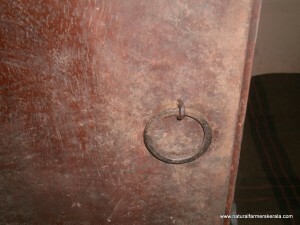 As per Gopalattan, when the iron is red hot it has to be hammered to the desired shape. Then comes the essential part – cooling. Red hot iron is dipped in water for a certain time in order to temper it. “If the metal is too hard it will break apart easily while chopping and if too soft then the edge will blunt quickly”. Traditional swords and warfare weapons were not dipped in plain water for cooling instead it was dipped in Poovan vaya neer (sap of elaichi kela in hindi). Modern day G9 and other hybrid banana sap will not work. Treating the blade in this fashion imparts it strength and flexibility according to my Kalari Gurukal. This is a traditional door handle 110 years old still in use made out of iron absolutely. Notice the lack of rust. All tools wear out. It is then taken back to the blacksmith for re-tuning and refitting. The quality (impurities in the metal) and usage determines the frequency of such visits. 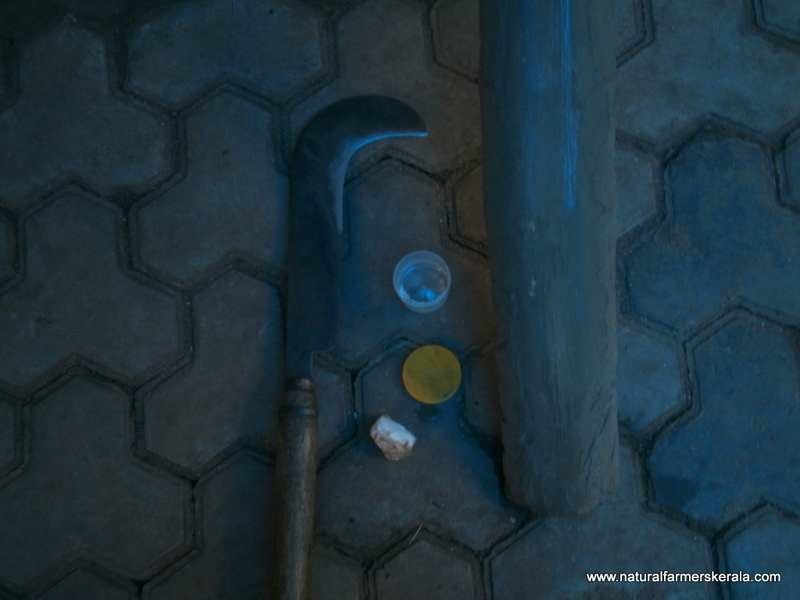 Powder flint stone and use heart wood for sharpening tools. b) 2 feet long piece of hard wood(teak, jackfruit, outer bark of a mature areca nut, rosewood). You can use any heartwood which has close grains. * First crush the flint stone into fine powder. * Now place the piece of hard wood on a stable platform in 45 degree angle. Ensure it is held in place. * Now glide the knife from its tip to heel in smooth and deliberate strokes. You will notice sparks initially. After a few seconds you will notice the metal changing color and it will be hot. * Keep doing it until desired result is achieved(it requires very little time) when you rub the knife on the piece of hard wood lot of friction is created which makes the metal hot and the flint powder cuts the metal and gives the desired result. The finer the flint powder the smoother the edge. Even if the flint is in granular form it will become fine powder in a few minutes but it will lead to serration. I use this technique even on smaller knives which I use like a razor blade to cut my finger nails. Works great. Thanks Gopalattan! Most people today in mid 50 go crazy. Feels good to see jovial Gopalattan working hard at such age. Keep it up……enjoying your informative blog. Thanks for posting this interesting article. I will try to place a link to it on my website. 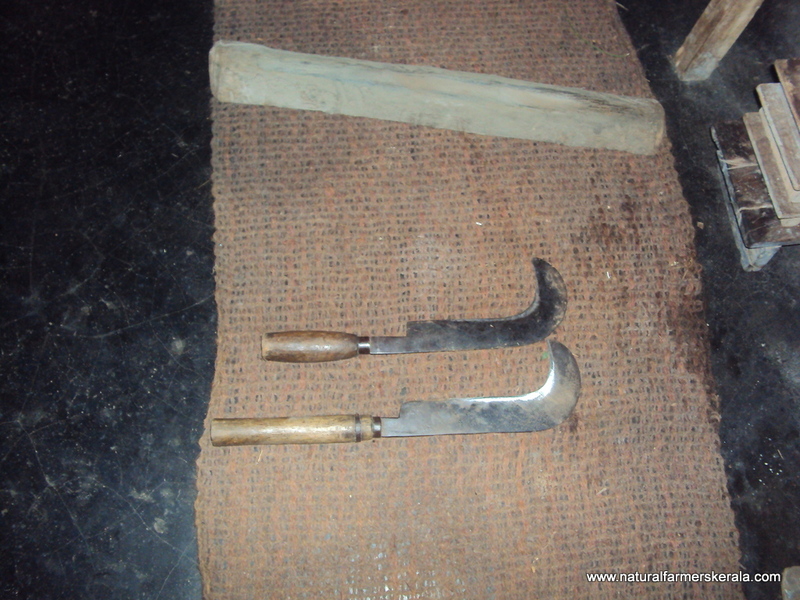 If you have other images of katiyal or billhooks, especially regional variations in blade shape, please send via e-mail or website and I will add a section on Indian (and Kerala) tools. 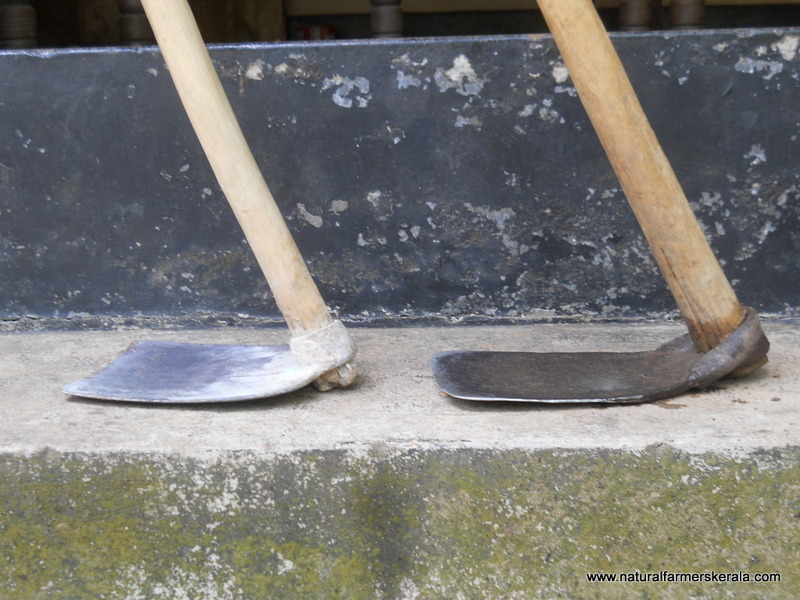 The way of sharpening is very interesting, similar was used in Europe for sharpening sickles and scythes, using a round stick, some animal fat and sand…. You are most welcome. I happened to see scythe for the first time in life couple of days back. looks and feels impressive. Lovely write up. Would love to visit a traditional smithy. Where do you meet Gopalettan? Dear Mr.Anoop can you get me a traditionally made pocket knife and a katiyal? Please let me know. Sorry I cannot help rightnow. As situation is really tensed near to my place. political issues. If you are based in Kannur I can give your the address.